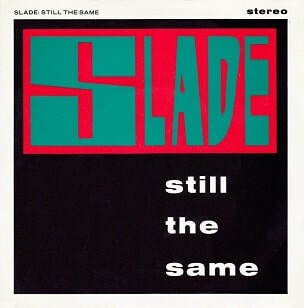 Still the Same is Slade's first single from their fourteenth studio album You Boyz Make Big Noize. Released by RCA on 2 February 1987, it reached No. 73 in the UK and remained in the charts for four weeks. The song was written by Noddy Holder and Jim Lea, and produced by John Punter. Following the moderate success of the band's 1985 albums Rogues Gallery and Crackers: The Christmas Party Album, Slade began writing and recording material for their next album in 1986. Hoping to record a hit album that would put them back in the public eye, "Still the Same" was chosen by RCA as the album's lead single. Plans for a Christmas 1986 release were scrapped and the single was held back until 1987 as an attempt to avoid Slade's label as being a Christmas-only band. The band felt that their connection with the festive season had not allowed them to develop the commercial and artistic credibility that they felt they deserved. RCA hoped "Still the Same" would reproduce the success of "My Oh My", however its release in February 1987 saw it only reach No. 73 in the UK. Despite this, the song did reach No. 14 on Sounds Hot Metal 60 Chart. In West Germany, the song went straight to No. 2 on the German "NDR 2" radio station, although it did not reach the singles chart there. In the UK, the single largely suffered from a lack of radio play. On BBC Radio 1, the single was not A-Listed, but B-Listed, reducing its airplay. In a 1987 fan club interview, Dave Hill spoke of the song's lack of chart success: ""Still the Same" is basically being regarded as a flop in terms of what was expected of it. I think the record company were mostly disappointed, as it was more them than the group who chose it. It was always up for a single though, right from the demo stage. We have a situation at Radio One at the moment where they now run this playlist. There have also been a few changes in the people who run the programmes. We brought this record out, in not the usual Christmas period, which on the face of it seemed to me to be a feasible idea as an attempt to get away from the 'Slade only exist at Christmas time' situation. On listening to opinion since though, it seems to have been regarded as another "My Oh My" type of song, which perhaps should have come out at Christmas. Everyone can say what they like now, and if it was a hit, they'll all be saying what a great idea it was. When "My Oh My" was released, it was just as slow to take off, but as soon as we got the radio play, it rocketed. "Still the same" did virtually the same as "My Oh My" chart-wise in its first few weeks, but at the point where "My Oh My" picked up the radio play, "Still the Same" was dropped completely, especially by Radio One." The lyrics of "Still the Same", written by Holder, have been reported to be speaking of his own marriage to Leandra, which ended in 1984, largely due to his touring commitments with Slade. In 1987, Hill felt the song "deserved to go much higher in the charts than it did". Later in 2008, Don Powell spoke of the song in a question about his preference between rock songs and ballads: "I enjoy the ballads, especially "My Oh My", "Still the Same" and a few of those, but I would prefer a rock song." "Still the Same" was released on 7" and 12" vinyl by RCA Records in the UK, Germany and Portugal. The 12" vinyl was released across other European countries too. The B-side, "Gotta Go Home", was exclusive to the single and would later appear on the band's 2007 compilation B-Sides. In the UK, a special limited edition commemorative version of the single was also issued to mark and celebrate Slade's 21st anniversary. This double pack edition included an additional 7" vinyl with "The Roaring Silence" as the A-side and "Don't Talk to Me About Love" as the B-side. The former track would appear on You Boyz Make Big Noize, while the latter would later be re-used as a B-side for the band's 1987 single "Ooh La La in L.A.". On the 12" single, an extended version of "Still the Same" was featured as the A-side. No music video was filmed to promote the single. Although a video had been planned, the idea was scrapped after the song failed to reach the UK Top 60. In the UK, the band performed the song on the TV shows The Tom O'Connor Show and Saturday Superstore. To promote the single in record stores, posters were produced, although these were mainly distributed to London retailers. Kerrang! said: "After another recent buffeting from Slade's perennial Xmas hit in every pub in the country, I thought it would be a blessing to hear them singing anything other than "Merry Xmas Everybody". But I doubt if many of us will have much fun listening to this soggy offering. The uptempo B-side, on the other hand, is far more listenable and would have stood a much better chance. In a review of You Boyz Make Big Noize, American newspaper Record-Journal wrote: "Songs, such as side one's "Still the Same" resplendent in its anthemic arrangement and heavenly harmonizing chorus, is not only a hook-filled, powerful tune, it's a primer for anybody who wants to be Jon Bon Jovi someday." In a retrospective review of You Boyz Make Big Noize, Doug Stone of AllMusic stated: "Slade's headiest daze long gone, the band amazingly squeezes out sparks like "Still the Same": always tunefully tight, but loose enough to sing in the pub." In the album's 2007 Salvo remaster liner notes, writer Chris Ingham said: "On the bombastic surface "Still the Same" sounds like a defiant cry of individuality and constancy, but underneath its a sad, resigned little song about a couple's inability to evolve." John Punter - producer of "Still the Same"
In 2003, Belgian band Mama's Jasje recorded the song for their fifth studio album Zwart Op Wit. The track was titled "Voor Jou Alleen" which translates to "For You Alone". As a result of the changed lyrics, Peter Van Laet also received a writing credit. The song became a hit in Belgium, peaking at No. 4.